Download "CSU Chico Educational Leadership and Administration Program Summary"
1 CSU Chico Educational Leadership and Administration Program Summary Program Design The Educational Leadership and Administration Program is located in the School of Education under the leadership of the SOE director and the Educational Leadership and Administration program coordinator. Both the director and the program coordinator serve on the School of Education Governance Council, which is the coordinating and internal advisory committee for the School of Education. This council facilitates communication, consistency and collaboration among programs of the School in regard to School and program operation, credentialing and accreditation. The program coordinator chairs meetings of the Educational Leadership and Administration Program faculty and supervisors who meet at least once per month to share information about the credential program, changes in admission requirements, and updates from the California Commission on Teacher Credentialing. Curriculum oversight at the university level is provided by the All-University Responsibility for Teacher Education Committee (AURTEC), which is composed of the Dean of the College of Communication and Education; the Dean of the College of Humanities and Fine Arts; the Dean of Graduate, International and Interdisciplinary Programs; the Director of the School of Education; the Coordinator of the Liberal Studies Program; the Chair of the Educational Policies and Procedures Committee (EPPC) of Academic Senate, and faculty representing Arts and Sciences Subject Matter Programs. AURTEC provides program and policy oversight for all programs of teacher preparation, including both undergraduate subject matter preparation programs and teacher credentialing programs. Significant changes to credential and subject matter programs are communicated to the Provost by AURTEC. The Educational Leadership and Administration Program at CSU, Chico is organized around the following five leadership roles: Role 1: Leader as Principal Teacher; Role 2: Leader as Purposeful Manager; Role 3: Leader as Inquirer, Reflector, and Connector; Role 4: Leader as Community Organizer; and Role 5: Leader as Change Agent in a Democracy. 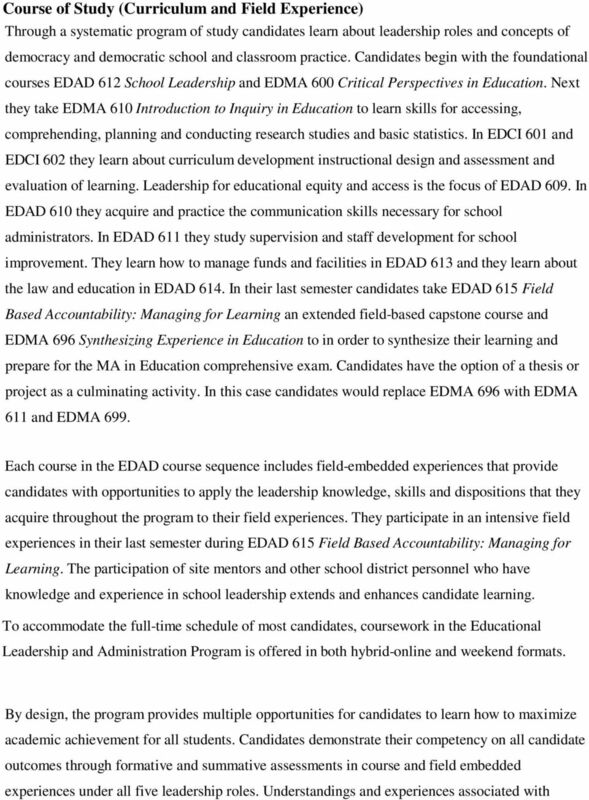 The leadership roles and accompanying candidate outcomes align with the California Standards for Professional Leaders (CPSELS) and California Commission on Teacher Credentialing (CCTC) program standards. 2 Candidates complete the requirements for the Educational Leadership and Administration Credential in a two-year cohort system that tracks candidates through a developmental sequence of learning and structured field experiences that meet the requirements for the Preliminary Administrative Services credential and also allow students to obtain a Master s degree in Education, Educational Administration Option. The cohort helps candidates acquire networking contacts and skills essential to their success as leaders at the school, district, or county levels. Some flexibility is designed into the cohort system to allow administrative candidates and administrative intern credential holders to participate in the administrative credential program together. The cohort design is intended to reflect best practices for adult learning while recognizing that working professionals at times need flexibility. Learning activities in courses and field-embedded experiences provide for transfer of theory to practice. The infusion model, in which topics are introduced explicitly in specific courses then addressed in greater detail and related to teaching and learning in subsequent courses and fieldembedded experiences, ensures that candidates understanding of teaching and learning processes is continually interrelated and reinforced. No significant program modifications have been made to the program in the past two years. 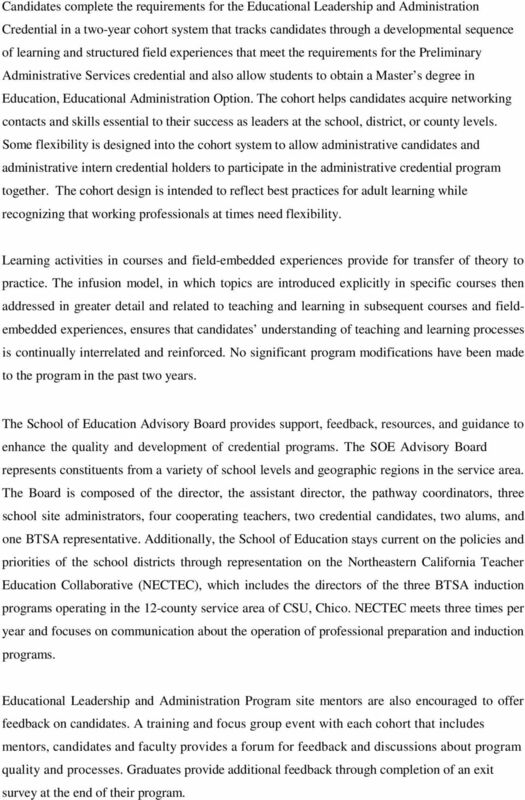 The School of Education Advisory Board provides support, feedback, resources, and guidance to enhance the quality and development of credential programs. The SOE Advisory Board represents constituents from a variety of school levels and geographic regions in the service area. The Board is composed of the director, the assistant director, the pathway coordinators, three school site administrators, four cooperating teachers, two credential candidates, two alums, and one BTSA representative. 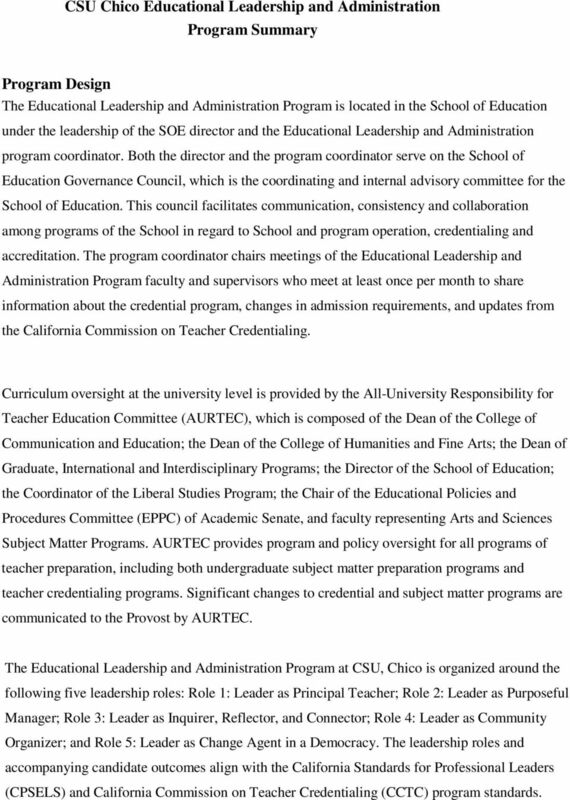 Additionally, the School of Education stays current on the policies and priorities of the school districts through representation on the Northeastern California Teacher Education Collaborative (NECTEC), which includes the directors of the three BTSA induction programs operating in the 12-county service area of CSU, Chico. NECTEC meets three times per year and focuses on communication about the operation of professional preparation and induction programs. 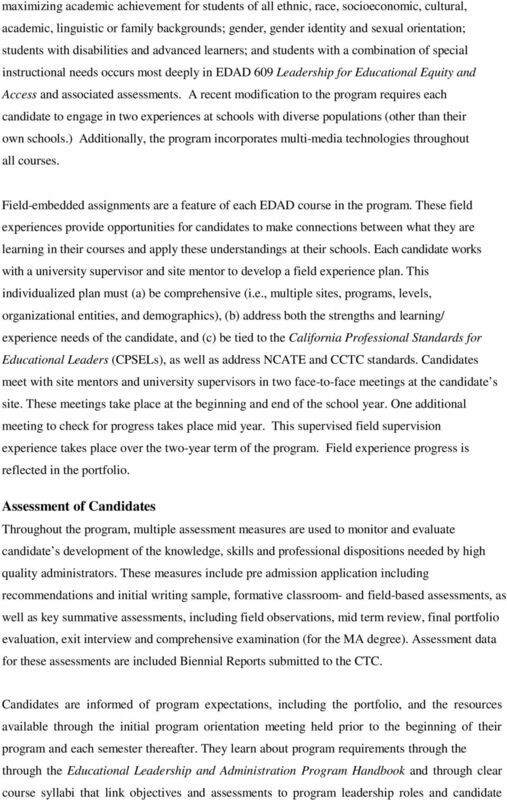 Educational Leadership and Administration Program site mentors are also encouraged to offer feedback on candidates. A training and focus group event with each cohort that includes mentors, candidates and faculty provides a forum for feedback and discussions about program quality and processes. Graduates provide additional feedback through completion of an exit survey at the end of their program. 5 outcomes and CPSELs. Candidates are provided additional information regarding the program throughout their courses. Candidates are given many opportunities to ask questions and seek clarification throughout their program. CONTINUOUS ASSESSMENT PLAN. For. ADMINISTRATIVE CERTIFICATION and RANK I STATUS. Within the. M. Ed. and Ed. S. DEGREE PROGRAMS.